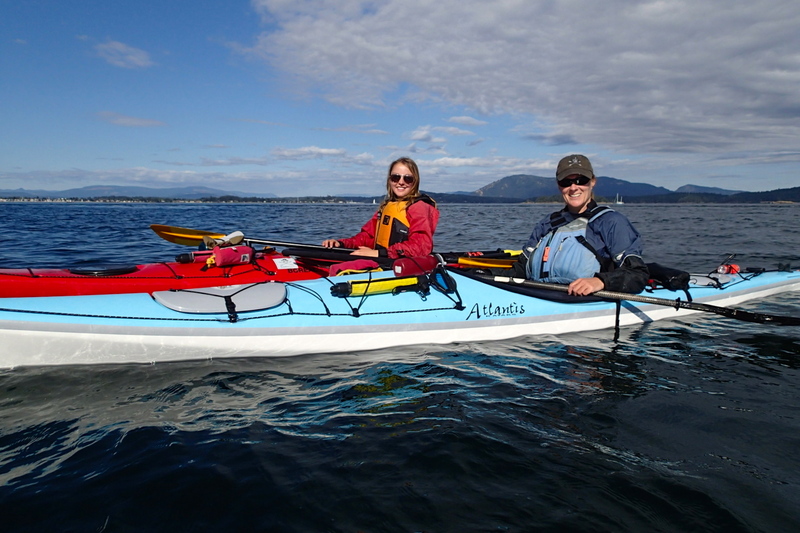 My wife, Katharine and I own a kayak tour company in Victoria and every summer we hire Adventure Tourism students to work in our shop. Last June we met Alexandra on one of our three hour kayak tours. She is studying Tourism in Montreal, Quebec and by the end of the kayak tour I knew Alex would be a perfect addition to our team. When we returned to the dock I offered her a job. Alex manages bookings, checks guests in and assists in the gearing up procedures. She picked up the job requirements quickly because she is organized, friendly and hard working. A beginner kayaker, Alex at every opportunity joined our kayak guides on their tours and assisted where she could. Soon we discovered her hidden talent, she is a very talented musician and singer. She frequently plays in public at open mic shows and other venues.She has a promising future performing. I grew up in the mountains of BC and every summer was spent camping at the lake so I was shocked to learn Alex had never been camping before. Katharine and I planned to correct this by September before Alex was to return to Quebec. We took three days off to kayak and camp the Southern Gulf Islands. Before leaving we planned a menu to include Alex’s gluten free diet, practised setting up our tent, and showed Alex how to pack camping gear specifically for kayaks into dry bags. I made this video for Alexandra so she would never forget her first summer on Vancouver Island and her first of many camping trips. We launched from Island View Beach on a windy but clear day and made good time across to D’arcy Island where we spent the first night. As we rounded the last bend of the channel between Little D’arcy Island and entered the bay at the National Park on D’arcy Island, the wind died. We rested and warmed ourselves in the sun on the beach before we set up camp. The next morning we woke to the shrill calls of the Black Oyster Catchers as they gathered their breakfast along the shore. We made an excellent egg scramble and broke camp efficiently so we could catch the flood tide to Rum Island. It was sunny but cool and we soon found a comfortable rhythm and needed to shed our paddling jackets. We stopped at Mandarte Island to watch the cormorants nesting while we each enjoyed an orange, a great kayak snack. We arrived at Rum Island by lunchtime and had our pick of the four raised tent pads, we had the small island to ourselves! Following a picnic of roasted chicken and potato salad we explored our new island. Rum Island is the only area I have seen the very rare Gulf Islands Cactus growing on the islands’ south facing hill. At sunset we toasted with spiced rum in celebration of Alex’s summer in Victoria. On our third day we kayaked along Sidney Island and through Cordova Channel back to Island View Beach. It was a clear, calm day and the paddling effortless as we rode the current back into shore. The water was crystal clear and we saw harbour seals napping in the bull kelp beds, brightly coloured rock crabs in the shallows, and numerous jellyfish. Kayaking the Gulf Islands with Alex was to see our home through new eyes and it was an excellent experience. We’ll be planning our next staff kayak outing for the Spring. The music accompanying this video is our very own Alexandra Berg singing and playing the guitar. Brad Armstrong and Katharine Palmer are the co owners of Kelp Reef Adventures. Both born in BC and lived on Vancouver Island as teenagers. Brad spent most of his younger days scuba diving in and around the Saanich Peninsula and Southern Gulf Islands while Katharine grew up on Pender Island, learning to kayak from a young age. Living on Vancouver Island they wanted to share their experiences with friends and family who couldn't join them, so they bought a video camera, which they take on every adventure now. The object of their videos is to show everyone the high quality of adventures that are available in British Columbia. Showing the average weekend warrior that with the right gear and a little training anything is possible. Stay tuned for the next adventure. 2 thoughts on "Kayak Camping. Have you tried it?" I’m so excited at the idea of camping out of my kayak!! The best way to experience the beauty of Canada’s west coast! I spent a lot of years kayaking and camping around the South Island as well as Vancouver Island’s west coast. The silence of a kayak means you experience up-close encounters with whales, porpoises, otters, seals and birdlife. Keep on promoting this eco-friendly form of recreation, Brad and Kathryn!